While scrolling through IG, the common theme this time of year is that most people are ready to be done with the dreary weather of fall/winter. Everyone is “so ready for spring!” However, in the PNW, even though our calendar says Spring, our weather is often an extension of winter. We know we have many weeks/months before we can officially wear a short sleeved shirt without freezing. This doesn’t mean that we aren’t ready to ditch our boots and sweaters for different types of clothing – skirts, blouses, shoes that show our toes, t-shirts, tank tops, etc. Trust us, by the time March rolls around, we’re definitely ready for change. 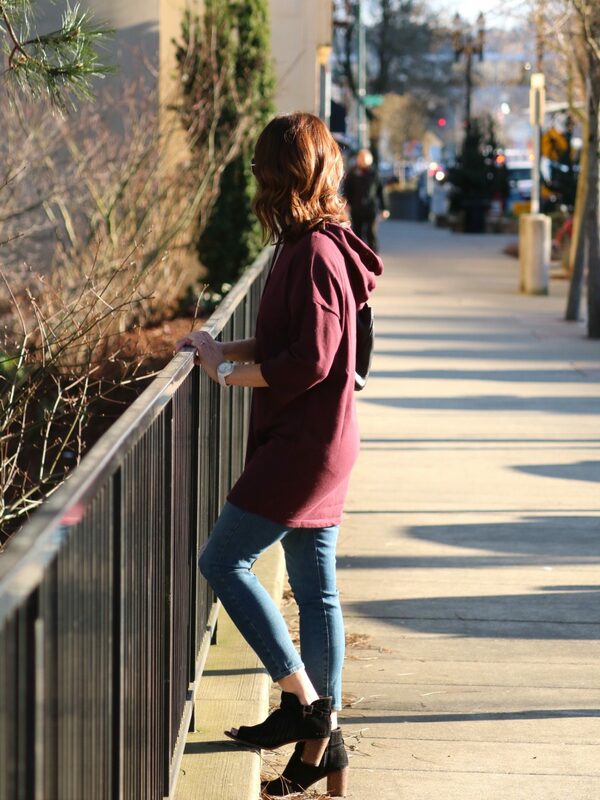 Don’t despair PNW fashionistas, there are ways we can enjoy spring clothing without our hands and feet going numb! 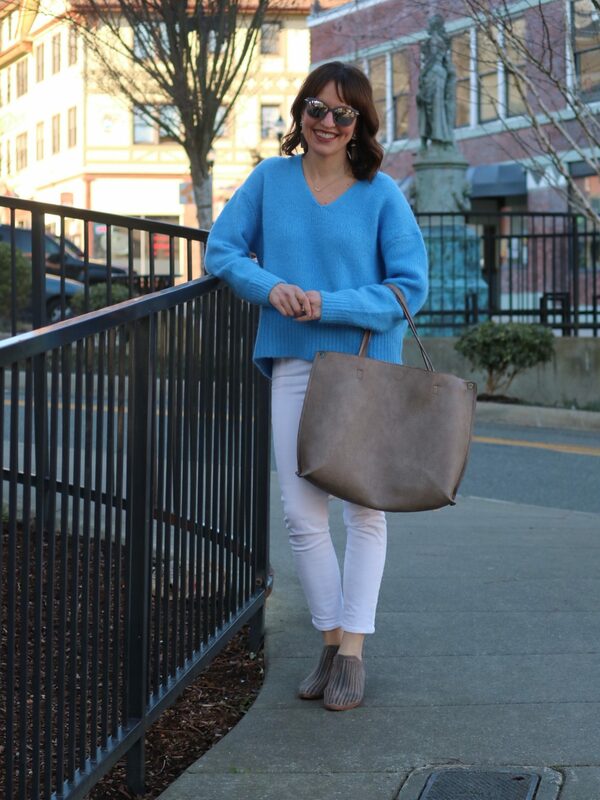 Wear pants and sweaters, but make sure they are in spring colors. White or bright colored jeans or chinos, sweaters in pretty spring colors and scarves that are lighter in weight and color. Wear spring shoes that also keep your feet warm. Switch out black booties for lighter neutral color booties. Wear mules, flats, or peep toe styles that cover your feet for the most part while giving a nod to spring. Get your toes ready (pedicure or paint them yourself) so right when the thermometer inches above 50 degrees you can expose them when you’ll be indoors most of the day. Ready to make a spring statement? 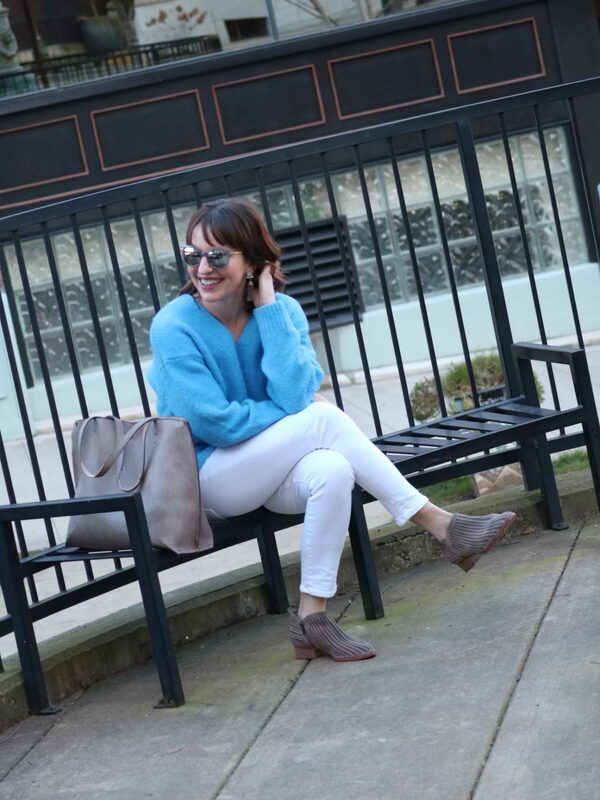 White jeans and lighter color booties are all you need. Layer up! In the PNW, layering is key. However, make sure each layer can stand alone. There’s no use layering if you can’t shed a layer! I used to make this mistake by wearing a t-shirt or tank under a sweater that I wouldn’t wear by itself because it was too tight, or stained or just not cute. So, when the weather heated up, I just got sweaty. Invest in layers you actually like and that will coordinate with all your outfits. Jackets, jackets, jackets! Our weather is perfect for all the varietal jackets that are out there – jean jackets, moto jackets, military inspired olive jackets, blazers, bomber jackets, the list goes on and on. If the weather is mild, you can get away with wearing these stylish spring jackets instead of a down parka. Throwing on a scarf also increases warmth. Wear them with your casual pants outfits or with cute spring dresses. You can read our post on styling moto jackets here. An olive green military style jacket is another great neutral choice for spring. We CAN dress for spring without freezing our buns off. Get ready with your “springy but warm” outfits so when the calendar changes (but our weather doesn’t) you can dress for the season in style!